#1 ERP and CRM that work together. Customer Management (also called Customer Relationship Management) was built into Acumatica from the very beginning. 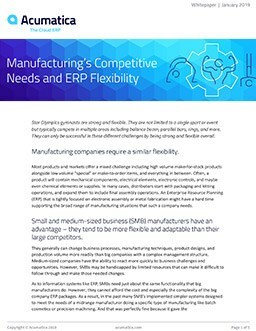 It is not a loosely integrated module like so many other midmarket ERP products. From marketing, quoting, and sales to delivery and post-sales support, customer information is always up to date and accurate. #2 Integrated content management. Acumatica provides a consolidated view of all customer records in a single database. This access to all written quotes, invoices, and support cases provides to every member of your team a 360-degree view of all customer activities and records. # 3 Visibility. Dashboards and reports provide real-time sales data to help your team manage forecasts, quotas, and results. Efficiently communicate and collaborate with customers through the Acumatica Customer Portal. Helpful tools give customers access to information about their interaction with your company and enable activities online. The Acumatica add-in works with incoming and outgoing email in Outlook. It searches for existing leads, contacts, and employees in CRM and then allows 1-click access to an existing contact. You can also create new leads and contacts right from your Inbox; create opportunities and cases associated with existing contacts; and log activity and attach e-mail contents to CRM. Acumatica ERP supports bi-directional real-time synchronization of data between Acumatica ERP and Salesforce CRM, allowing for simultaneous work in both systems. In an ideal world, ERP and CRM would play nicely together. ERP systems automate the processes that focus on identification and fulfillment of customer demand. Customer relationship management (CRM) software is a natural complement to ERP systems. What our customers are saying about Acumatica's Customer Management? Acumatica’s SaaS solution provided users with access to real-time data across seven companies in three different locations. What really made [Acumatica] more appealing to us was the fact that it’s cloud-based. We had VPN service before … but it was slow and clunky, and because this is cloud-based I can work from anywhere at any time.